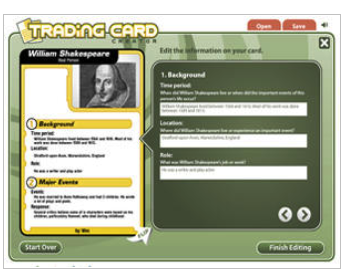 Trading Card Creator is a web tool from ReadWriteThink that you can use with your students for various educational purposes most important of them all is to help them enhance their writing skills. Trading Card tool provides card templates which students can use to describe characters, places, abstract topics, events, and objects. Cards come with a set of questions to guide students responses and to help them focus on the aspects that matters most to their descriptive narrative. Students, for instance, can create trading cards for characters drawn from their favourites TV shows, movies, comic books, graphic novels..etc. When their cards are ready they can easily print and share them with the whole class. Trading Card Creator is simple and easy to use. Here is how to start creating your own trading card: click on Trading Card tool and type in your name in the displayed window and hit ‘Start’. Next, enter a topic and select a type for your card. There are 7 card templates to choose from: Fiction Person, Real Person, Fictional Place, Real Place, Physical Object, Event, and Abstract Concept. Alternatively, you can design your own card from scratch by clicking on the ‘Create Your Own’ button. Once you select the card you want to work on, provide answers to the questions embedded in the card, upload a photo and click to save, print and share your final production. For ideas on how to use Trading Card Tool with your students, check out this page.